Well-made long sleeve shirts can be hard to find—and when you do find one that fits perfectly, the design may leave something to be desired. Not at Monkey in a Dryer Screen Printing! The humans I work with use some of the best brands and always make sure your design is exactly the way you want. Contact us today to learn more about our ladies’ long sleeve shirts. We are based in Hopkins, Minnesota, and proudly serve all of the Minneapolis/St. Paul area and ship products to customers nationally and all over the world. An indispensable t-shirt in a classic silhouette–with a very friendly price. Part of the new relaxed collection, this tee has a new modern, relaxed fit for effortless style. 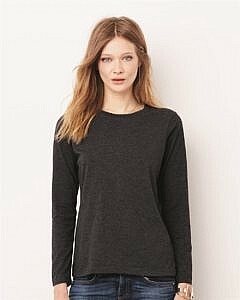 The must-have long sleeve tee with a luxuriously soft feel that is designed to drape perfectly and accentuate a woman’s figure. This classic women’s tee fits like a well-loved favorite, featuring a semi-relaxed fit, classic crew neck. The classic retro vintage style baseball tee receives a fresh update with its slim fit, and contrast raglan three-quarter sleeves. #1 selling comfy trendy jersey for spirit wear game day events. 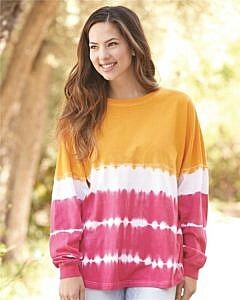 Loose fitting and available in a rainbow of colors!